Their parents do not have the confidence in existing facilities to entrust their daughters to be away from home. Most of us have come from countries where we have been fortunate enough to take the lifelong gift of education for granted. Despite the Moroccan Government’s support of education policy and women’s rights, half of the country is not literate, and in rural areas, up to 83% of women are illiterate. We believe investing in girls’ education is essential, as an educated girl educates her family and whole community. 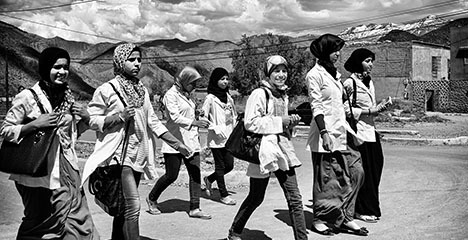 Education For All (EFA) was established to help provide the opportunity of a secondary education for girls from the High Atlas mountain region. We build and run high-quality boarding houses for girls from 12–18. Everything is provided for free. We offer 3 nutritious meals a day, hot showers, cosy beds, access to computers, study support via an international volunteer programme and dedicated, local housemothers. The overall environment makes it easy for the girls to settle in and thrive in their studies. We see an average of 90% pass rate across all years and now have 50 EFA girls enrolled at university! EFA’s first project opened in 2007, giving access to secondary education for up to 36 girls. It was challenging to convince parents to send their daughters to us, but after only a few years we needed to expand to meet the demand for places! 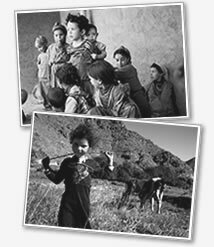 In September 2009, we opened a second boarding house in an even more remote area of the High Atlas 100 km from Marrakech in the town of Talaat n’Yacoub. This increased our intake to 36 more girls and in 2010 we built a new one in Ouirgane. Since then we have and have opened 2 more houses, including our recent one in Asni in 2016, bringing our total to 5. The most recent one is our biggest with a capacity of 48 girls, taking our total to 185 in 2017. Apart from a paid housemother, assistants and cooks, there are no local administrative expenses as both the committee and volunteers work on a voluntary basis. Since 2013 we began employing a part-time fundraiser and communications manager to support the expansion of EFA. We also have some fees via JustGiving fundraising platform, but this still means that 90% of all donations go directly to the project which is quite rare. If you would like to make a large donation and and avoiding JustGiving’s charges, please contact us using the email link below or see the DONATION section which gives other means of making direct transfers to our dollar, euro, Moroccan or sterling accounts. Once you are a donor, you are welcome to visit us, and see first-hand where your donations are going and the impact they are having.